Kittens Need To Grow Up With Kittens – Please Adopt Two! Home / Kittens Need To Grow Up With Kittens – Please Adopt Two! Even people who love cats as much as I do have to admit that a single kitten can be very annoying. And that’s why so many are returned to the shelters they came from. 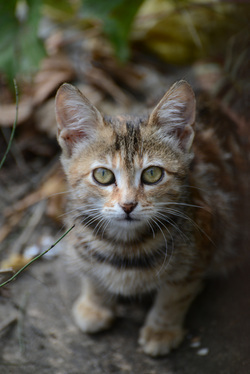 While most shelters and rescues are eager to just adopt kittens out without giving much thought to whether they’ll be successful in their new homes, many cat experts know kittens need to grow up with other kittens in order to be happy, healthy and well-adjusted. Are you thinking about adopting a kitten? Here are 10 reasons to adopt two instead of just one. Adopting litter mates is always best, but two kittens close to the same age will work, too. 1. A human, even the most loving, attentive human, is not an adequate replacement for another cat. There’s a lot to be said for living with someone of the same species and someone who understands and speaks your language. 2. Kittens learn from other kittens, and cats learn from watching each other. When one kitten learns to use the litter box, his buddy will soon figure it out, too. And that’s just one lesson that’s important in the lives of successful house cats. 3. A bored kitten is a destructive kitten. And kittens get bored when they’re alone. Your little guy is less likely to climb the draperies and play soccer with your collectibles if he has a buddy to romp with on the floor. 4. Kittens have endless energy and need playmates. If your kitten doesn’t have another kitten to play with, he’ll want to play with you. Constantly. 5. Kittens teach kittens how to play nicely with other cats and humans. If one of your kittens bites the other too hard or scratches too much, his buddy will let him know. Kittens bite. That’s what they do. It’s better for him to bite another kitten than to bite you! 6. Your kitten will stalk and pounce on his buddy when he walks by, not on you. Stalking and pouncing is natural behavior for cats. But when it’s directed at humans, it’s often mistaken for aggression. 7. A single kitten will make your adult cat miserable. She’s beyond the age where she wants to wrestle nonstop and get jumped on when she’s on her way to the litter box. Young kittens can be very annoying and even frightening for adult cats. If you have two kittens, they’ll leave your adult cat alone. 8. Kittens who live with other kittens are happier and tend to be healthier than kittens who live alone. 9. If you adopt two kittens, they’ll be friends for life. 10. Two kittens are even cuter than one. There’s nothing more fun than watching two kittens romp and play together. And there’s nothing more endearing than seeing two kittens wash up together after a meal and snuggle on top of each other for a nap. Oh, here’s another reason to adopt two kittens. If you adopt from a kill shelter, you’ll be saving two lives instead of just one. That, in itself, is a good reason to give two kittens a forever home.